This fantastic introduction to India combines the three cities of the ‘Golden Triangle’ with a couple of days in Ranthambore National Park. Journeying in a loop from Delhi, you’ll tick off highlights including the Taj Mahal and the forts and pink-hued palaces of Jaipur. 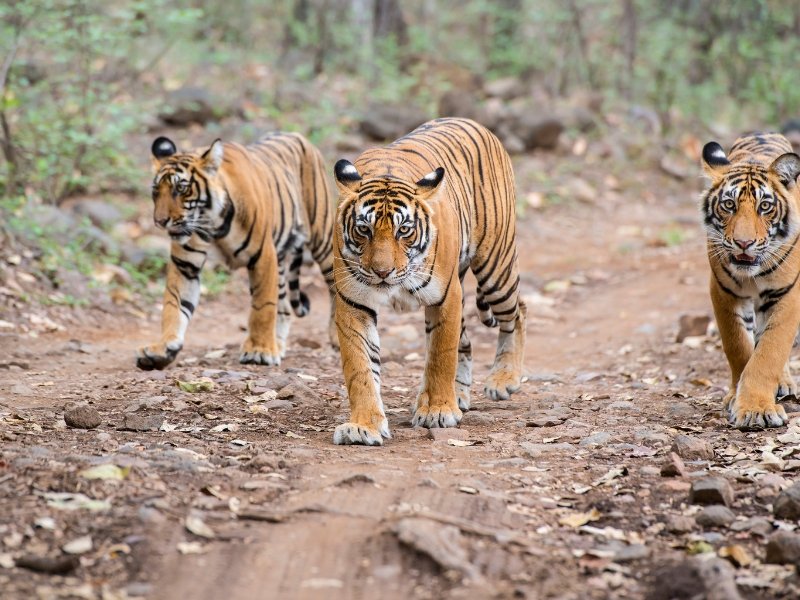 With three safari drives in Ranthambore, we’ll go in search of the park’s elusive Bengal tigers, as well as looking out for leopards, sloth bears, monkeys and all manner of birdlife. Titan’s VIP door-to-door travel service collects you from home, for your flight to Delhi. Upon arrival, we transfer to the Grand New Delhi (5T). After a little time for refreshment and relaxation, we head out on an afternoon sightseeing tour of New Delhi, first passing the India Gate memorial, built to commemorate the Indian soldiers who died during the Great War, before continuing to Rashtrapati Bhavan, the official residence of the President of India. Later we continue to Qutab Minar, the tallest brick minaret in the world, and designated a UNESCO World Heritage Site. Our morning tour concentrates on Old Delhi, also known as Shah Jahanabad. We visit the great Jama Masjid, the principal mosque of Old Delhi, built in 1656 by the Mughal Emperor Shah Jahan. Later we reach Raj Ghat – the memorial to Mahatma Gandhi – a simple black marble platform that marks the spot of his cremation. Later we visit Humayun’s Tomb, the memorial of the Mughal Emperor, Humayun. Now a UNESCO World Heritage Site, this is the first example of Persian inspired Mughal architecture in India. We drive to the riverside city of Agra in the afternoon, where our hotel for two nights is the Radisson Blu Agra (4T). Often described as the greatest monument to love ever created, the Taj Mahal is another grand edifice that dates back to the glory days of India’s Mughal emperors. It took 20,000 skilled labourers to create this mausoleum and memorial to Shah Jahan’s favourite wife, Mumtaz Mahal. Some see it as a profoundly sad creation, infused in every stone with grief and loss, others an exuberant celebration of love and life. After a morning dedicated to contemplation of this undoubted wonder of the world, we visit Agra’s imposing fort – a walled city of palaces, mosques, halls and residences occupied for more than 900 years. Our journey continues with a visit to Fatehpur Sikri. As the political capital of the Mughal Empire for a little over a decade in the 16th century, Fatehpur Sikri must have been a breathtaking sight to behold – an architecturally harmonious wonderland of palaces, pavilions, public residences, mosques and parks. But, superseded by a new capital at Lahore – better located for waging war on the Afghan tribes – Fatehpur Sikri remained abandoned and virtually unknown for hundreds of years. Visitors today may appreciate the original buildings in a stunningly-good state of preservation, along with the palpable mystique of a ‘ghost city’. Later, we continue by road to Bharatpur and join our train bound for Sawai Madhopur. On arrival we take the short transfer to Ranthambore National Park. Formerly the private hunting ground of the maharajas of Jaipur, the park is now better known for its 1,000-year-old fort, surrendering slowly to the encroaching jungle, its picturesque turquoise lakes and, of course, its Bengal tiger reserve. Our lodge for two nights is the Ranthambore Regency (3T+). Two safari drives present the opportunity to spot characterful residents of this wildlife haven, including leopard, monkey, sloth bear and myriad species of bird. The grand prize is a sighting of the Bengal tiger – a greater possibility thanks to the work of the Ranthambore Foundation, which has striven to conserve the forest cover and increase the bodies of water; work which has borne fruit in a tiger population much increased since 1998. A third safari drive inspires yet more fond memories of this fine national park and its enchanting residents, and then we drive to Jaipur, popularly known as the ‘pink city’, where our hotel for two nights is the LaLit Jaipur (4T+). A full day tour of Jaipur and its environs reveals why this great city is considered one of India’s foremost cultural attractions. After an early breakfast, we drive up to Amber Fort, as remarkable for the majestic grandeur of its surroundings as for its sturdy battlements and beautiful red sandstone palaces. We tour the hilltop redoubt, then head to the serene foothill lake, where the fort is romantically reflected and where elephants are often seen to bathe. Back in Jaipur itself, the splendid City Palace, an engaging fusion of Rajasthani and Mughal architecture, the 18th century Jantar Mantar observatory, with its huge stone instruments used to study the movement of the constellations, and a view of the stunning Hawa Mahal (Palace of Winds), with its instantly recognisable latticed façade, occupy our afternoon. We depart Jaipur for Delhi and a final night at Roseate House (5T). After one last cup of chai, transfer to the airport for your return flight to the UK. Upon arrival, your Titan vehicle will be waiting for the journey home.